Arnon’s second annual technical seminar provided insights into technology trends as well as individual cutting-edge solutions. 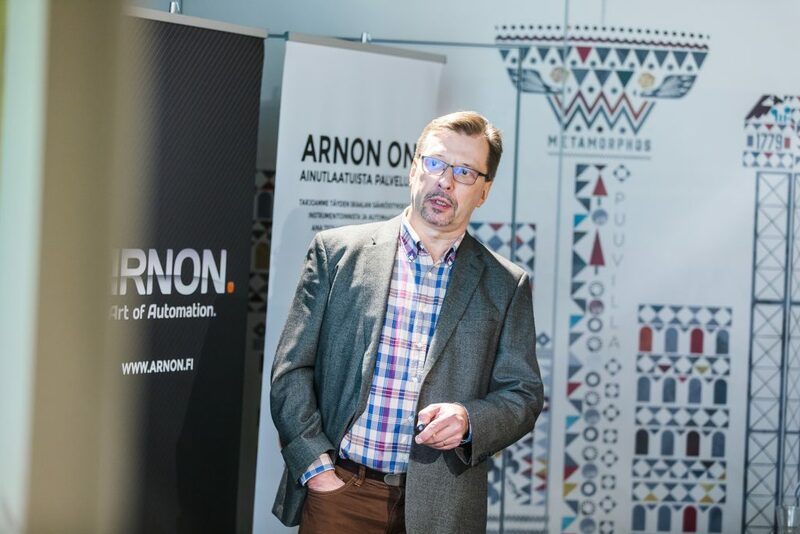 Jarmo Puputti, Chairman of the Board at Arnon, kicked off the day, asking the participants to listen to the presentations with a critical mindset and to share their thoughts. The request was fulfilled: the presentations gave rise to a lively debate among the audience consisting of Arnon clients and other interest groups. The presentations highlighted the importance of functional teams and collaboration between clients and suppliers. “We are our clients,” said Puputti, summarising the day from Arnon’s point of view. Seppo Valkealahti, Professor of Electrical Energy Engineering at the University of Tampere, provided a comprehensive overview of the development of energy technology and, particularly, renewable energy. Of all forms of energy production, solar energy emerged with the most potential since it is inexhaustible, renewable and emission-free. Valkealahti predicted that, in 10–12 years, the main source of electricity will be solar energy – with regional variations, of course. Valkealahti demonstrated how quickly the market was changing by presenting cases such as the exponential growth rate of electric car sales in the world. The product, in commercial production since just a decade, exceeded a million items in annual sales already in 2017. "Valkealahti predicted that, in 10–12 years, the main source of electricity will be solar energy"
Climeon, a Swedish company that turns low-temperature waste heat and geothermal heat into clean energy, is currently opening new markets across the globe. 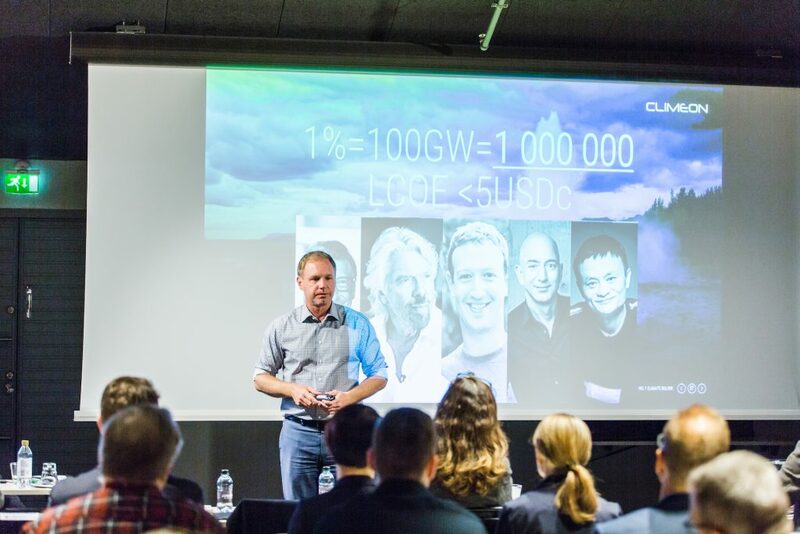 Presentations by Climeon’s CEO Thomas Öström and Strategic Sourcing Manager Patrik Sjölander convinced the public: the company is able to produce emission-free energy at a competitive price regardless of weather conditions. Via Baseload Capital, a company partly owned by Climeon, the company can also help its clients with financing. The Climeon team saw Valkealahti’s example of the rise of electric cars as a good inspiration for Climeon. “It’s not a marathon, it’s a series of sprints,” said Öström, describing Climeon’s development." 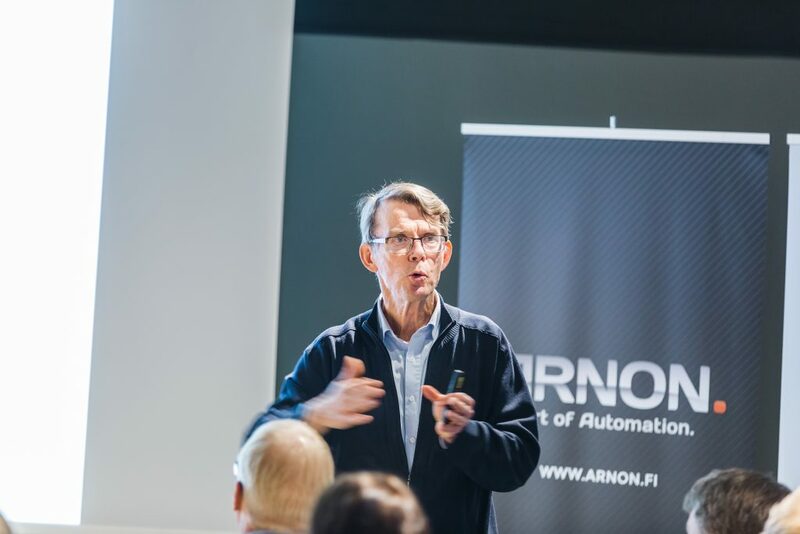 Arto Peltomaa, Program Manager at Dimecc Oy that develops industrial research, product development and innovation activity, highlighted the opportunities brought about by artificial intelligence, machine learning and deep learning. Peltomaa showcased practical examples of how companies become users of artificial intelligence. 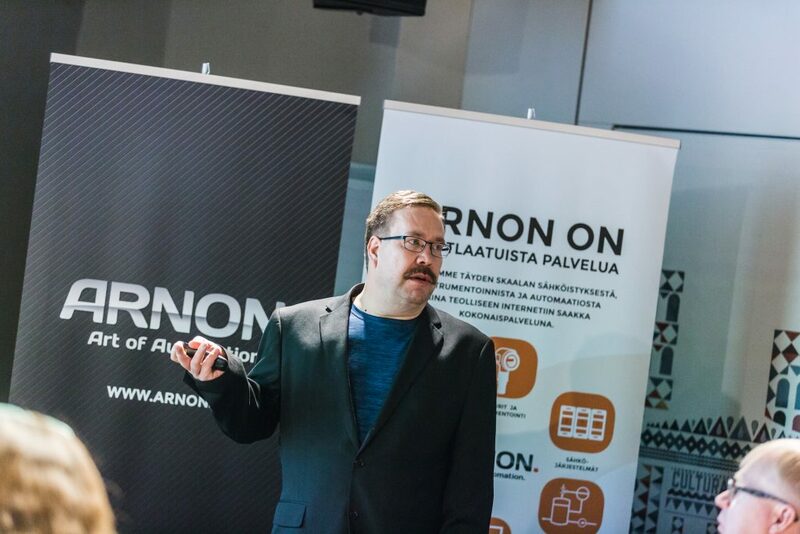 “The important thing is to increase in-house expertise and ensure that pilot projects work as they should – small-scale success cases are major contributors to the deployment of artificial intelligence,” said Peltomaa. "Small-scale success cases are major contributors to the deployment of artificial intelligence,” stated Peltomaa. 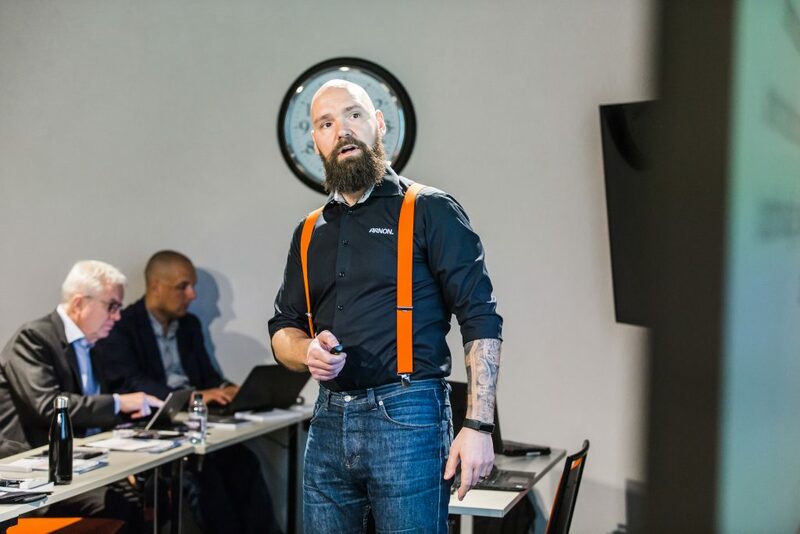 Tal Zarum, Head of Programmes and Supply Chain at Sandvik, presented the current state of digitalisation in the mining industry. The entire industry is changing, driven by data and technology: New mines are already being planned with full automation in mind and Sandvik is heavily involved. The OptiMine data management system works as the brain of the mine: it collects information from both machines and people and enables real-time monitoring of underground operations. The AutoMine product family includes mining applications such as machinery that is remotely operated, autonomously operational or controlled by a single person. 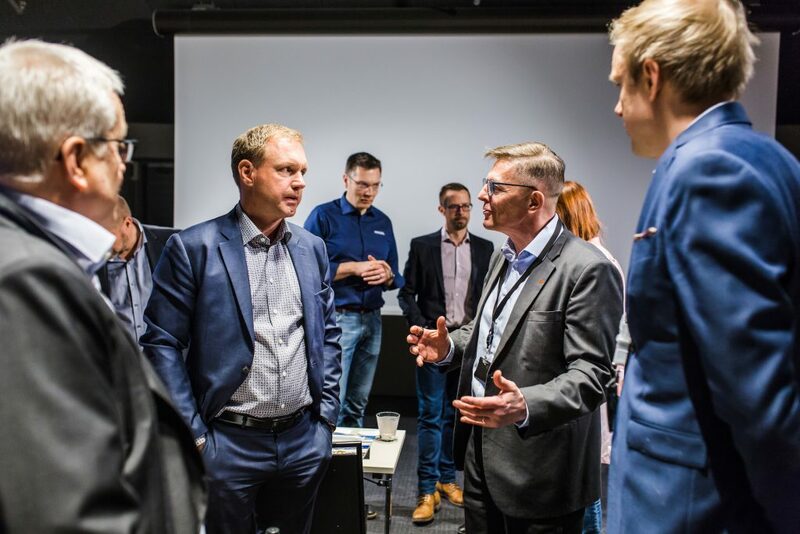 Arnon’s Technology Director Timo Hanhimäki and Offering Manager Antti Lahti described a solution that collects data from a power plant’s machines, equipment and processes and transmits it almost in real time. The solution takes into account tight data security requirements and the effortlessness of utilising the information. The plant produces nearly 10,000 measurements each second, and the necessary information is accessible in a cloud service, regardless of where and when you want to use it. Now this entity, implemented for a Wärtsilä power plant, can be reproduced for other fields of operation as well. Samuli Kinnunen, Vice President of Automation at Andritz, provided a perspective on the scale of the pulp mill: When a second pulp production line was built at the Suzano pulp mill in Brazil, the number of deliveries totalled 118,410 tonnes, almost 20% of which arrived from abroad. There were 404 excessively large deliveries, of which 221 originated from outside Brazil. To ensure that the production line could be built according to plan, it was necessary to know the exact location and condition of the deliveries. With Packaware, Andritz could keep track of the delivery locations even better than the carrier. The monitoring software observed a U-turn taking place on the Baltic Sea, and they could respond to the resulting delay in good time. User management was convenient with the easy-to-use Packaware, integrated into Andritz’s Microsoft Azure AD services. Engrossing topics ensured that the discussion flowed on breaks. We would like to thank all speakers and participants – please join our traditional seminar next year, too! Always work with the best in the world.